Yesterday morning (March 4th), the Indy Racing League driver Bia Figueiredo had the chance to speed up the engine of his Honda V8 650 horsepower in the city of Sao Paulo. 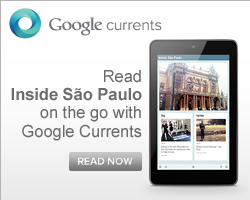 It happened at 5h40am, in a provisional route of six kilometers inside the city, passing through landscapes of São Paulo, such as: the Municipal Theater (in the central region) on the Obelisk (in front of the Ibirapuera Park), along the Avenida 23 de Maio and around the Monumento à Bandeira (sculpture symbol of the Inside São Paulo blog), also in the Ibirapuera Park. The structure of this route had the support of the CET (Traffic Engineering Company) in the interdiction of some streets for the passage of the F-Indy car. In the coming days (March 13th and 14th) São Paulo will host the opening race of the 2010 season of the IZOD IndyCar Series. The track of the São Paulo Indy 300 is under construction and will be held on a street circuit of 4.180 meters mounted on the Sambódromo Anhembi. 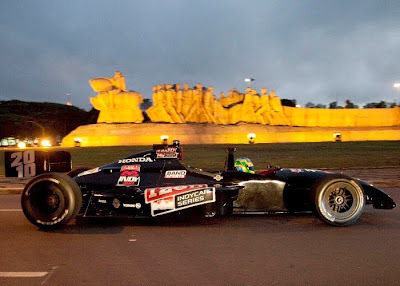 To promote the championship, the debuting pilot Bia Figueiredo (who is a Brazilian woman and also Paulista), was called to drive a Formula Indy car inside the city. Figueiredo works for the team Dreyer & Reinbold Racing.